As an atheist I believed in what I could see, not in what I could not see. The “natural” was something I could see – the “supernatural” was not. So, the archaeological finds that supported various aspects of the historicity of the Old Testament impressed me. Even though most of the ancient discoveries were located in museums around the world, being able to see photos of the objects and knowing that I could see them in person if I wanted to helped me in my investigation about whether the Old Testament of the Bible was verifiable on any level. I was especially interested in whether the Old Testament was rooted in myth and legend or in history. The 19th and 20th centuries AD were a great period of time for archaeological discoveries about some of the oldest civilizations of the world. Oriental studies and research led many explorers and archaeologists into the Middle and Far East looking for ancient treasures. Some of them that we’ve already looked at include the Philistines, Hittites, Dead Sea Scrolls, and Assyrians. Another ancient people recorded in the Old Testament and uncovered by archaeologists are the Moabites. The Moabites were an ancient people living in an area of the Middle East known as Moab. Moab was located just east of the Dead Sea, directly across from the ancient Kingdom of Judah. Moab is first mentioned in Genesis 19. Lot was Abraham’s nephew, so Moab and his family were relatives of Abraham’s son Isaac and his son Jacob (Israel). However, the Moabites and Israelites were not usually friendly relatives. The Old Testament of the Bible records many problems between the two peoples, but where’s the proof that the Moabites existed and that they had any relation with ancient Israel? One such archaeological find is known as the Moabite Stone, also known as the Mesha Inscription or Stele (named after King Mesha of Moab). F.A. Klein discovered the stone in 1868 and a French scholar named Charles Clermont-Ganneau made a “squeeze” impression of the writing for further investigation. Arabs in possession of the stone reportedly broke it into several pieces. However, more than half of the stone’s pieces were found and eventually housed at the Louvre in Paris. 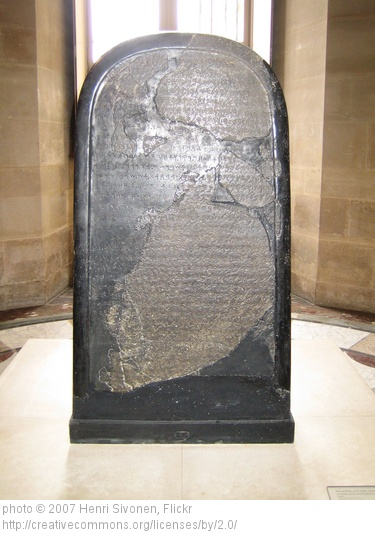 The Mesha Stele names the nation Israel and two of its kings, Omri and his son. King Mesha admitted that King Omri humbled Moab for many days, but said it was because Chemosh was angry at his land. Mesha said that Omri’s son also humbled Moab, but that Mesha truimphed over him and his house. How does that compare to the Bible’s reference to King Mesha and the Moabites during the same period of time (9th century BC)? Though the endings of the stories are different, what we see is the record of an ancient enemy king of Israel confirming basic historical information about Israel’s kings, their humbling of Moab and a revolt by Moab against Israel. That’s a lot of confirmation in the world of ancient civilizations. Albright, W. F. “Palestinian Inscriptions.” In Ancient Near Eastern Texts, edited by James B. Pritchard, 320-22. 3rd ed. Princeton: Princeton Univ. Press, 1969. Miller, Patrick D. “A Note on the Mesha Inscription.” Orientalia 38 (1969) 461-64.